Please note min 7 day booking for xmas and jan School Holidays and february is 3 days.. otherwise min 2 days. COPA SHELLS BEACH HOUSE is the perfect house for families or friends wanting to enjoy a relaxing holiday. A lot of love and care has been put into this house and has been holiday let for 14 years now. This house is mainly for families of up to 5 people. House hasBroadband, HD TV , double filtered water system,and air con', inverted heating, new wood fire. A lot of care and effort has gone into making this house a great getaway for a holiday. This fully furnished original beach house has 3 bedrooms plus a roomy fourth lounge room as a separate tv for kids. Surrounded by trees and views of estuary and gardens gives this home a very private feel. Walk down the front lawn stairway to beach. A Flat 100-200mtre walk will take you to the lagoon and beach, and shops. Fenced in front yard for kids and behaved dogs. Large veranda with Views to ocean and lagoon with NO HOUSES IN FRONT OF YOU! Just water and trees. Polished Floors, Open Plan living/kitchen- kitchen is very well with new water filter, new DISHWASHER, 2 fridges, and 2x split system AIR CONDITIONERS which to be used with respect- New BBQ on deck. The house is fully furnished. Living room has a comfortable lounge suite with dining table and another table plus fireplace, DVD and stereo. Walk in 5 min to shops, Parks, Lagoon, Beach, tennis courts, fishing spots, golf, House trained pets ok...must be clean and not left alone on property. The only thing you bring is linen and towels. Please note that Copacabana is a residential area and I respect my neighbors who live near me-it is fine to have a great relaxing holiday but note that this home is not to be used for events such as bucks parties, schoolies celebrations or similar events. I am very strict on limit of people. Copacabana ("Copa") has a relaxed seaside village atmosphere and is surrounded by beach, lagoon and national parks. If you are looking for a commercialised, developed beach resort - then you wont find it at Copa. This seaside village has a laid back atmosphere, so if you are looking for a great beach to catch up on your tan and is safe for the kids or if you are a keen surfer then Copa is for you. 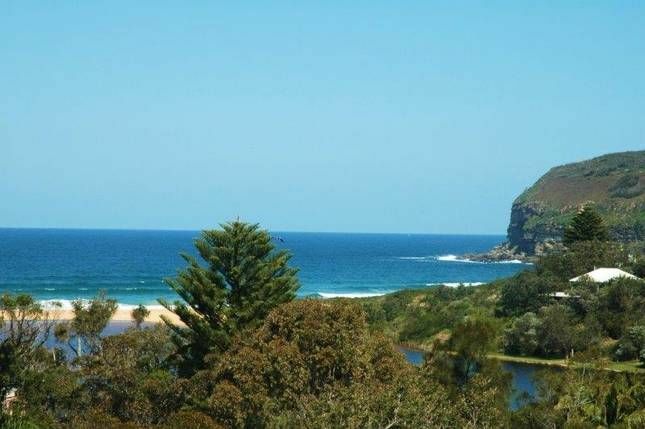 Copa is situated close to other popular beaches such as Avoca, Terrigal and McMasters. Copa Shells is an easy 5 minute flat walk to surf beach and local village shops & cafes, where you can enjoy a or have brunch at the local cafes or a seafood or steak dinner at the Wbreakfat, lunch, and dinner at local cafes or seafood and steak at White Sands Rest. (Theres also a great takeaway for those looking for a hamburger and chips hit!) Stroll or jog along the beach, go for an early morning surf or swim; try kayaking on the lagoon, bushwalk one of the many trails, take the kids fishing or for a game of tennis or a round of golf in the afternoon. Perfect little beach shack, in a perfect location - great customer service from Cheryl also. Cheryl was very accommodating and easy to contact. We had a wonderful time at her house, there was plenty of room for a family of 4, easy walk to the beach, lovely gardens and the kitchen was stocked with essentials. Great to find a house where our puppy could hang out with us too! Nice location. Window and curtain rods broken. Crockery dirty. Broken wood and rusty nails scattered around the garden. House cluttered with too much furniture. Junk pile next to courtyard. CCTV cameras on the deck. The location of this house is nice, just a short walk to Copa beach and the lagoon, both of which are beautiful. If you are coming to this house with young children, it would be a good idea to walk around the gardens before you let the kids loose - there was a large tub of old dirty water and rusty tools lying around under the house, and a lot of wood from broken furniture with rusty nails scattered around the lawn. The area next to the courtyard looked like a scrap metal yard, piled up with junk and old things. Also, keep the kids away from the windows, as the curtain rods aren't attached to anything - if you open the curtain the whole thing falls down and someone could get a whack on the head. Most of the rods are wooden but the one in the bedroom is metal and very heavy. And be careful of the bedroom window - the frame is broken and just hangs limply like a broken wing. If you're travelling with pooch, the back garden is fenced but not even remotely dogproof - our dog was out and on the loose in under 5 minutes. There were too many escape points to barricade so we just didn't bother letting him in the garden. The house is quite small and has funny access to some rooms - one bedroom can only be reached by going through the toilet. There is a lot of furniture in the house. It became more liveable once we moved all the bits and pieces that were in the way into a spare bedroom. On the plus side, the kitchen was well stocked with equipment. Lots of utensils and plates and pots, which is always nice. Maybe bring your own cups - the dishwasher seemed to have left a lot of dried-on stuff on the ones in the cupboard. It could be a nice house with repairs and a major clean out. But I wouldn't recommend it in its current state. This was the perfect location for they holiday we intended on having. If you want to relax and enjoy hearing the waves crashing and birds chirping this is the place you want to be. We were able to have my husband and myself our 2 teenage daughters 2 cats and our puppy inside the house that has more than enough room. The house was clean and tidy, kitchen has everything needed to cook up a storm. It was cool enough for us to be able to use the fireplace so bonus for us. laundry and bathroom facilities great. Great old quint and quirky cottage that has alot of character. Short stroll to beach shops and surf club. We will be booking again very soon. Thanks Cheryl was a pleasure for sure. Decent stay but mouse wasn't invited! Our group had a lovely stay and enjoyed a pot-belly fire on the balcony one night. However, supplies of dishwasher tablets and toilet paper was very low, and the resident mouse made us all a bit anxious!